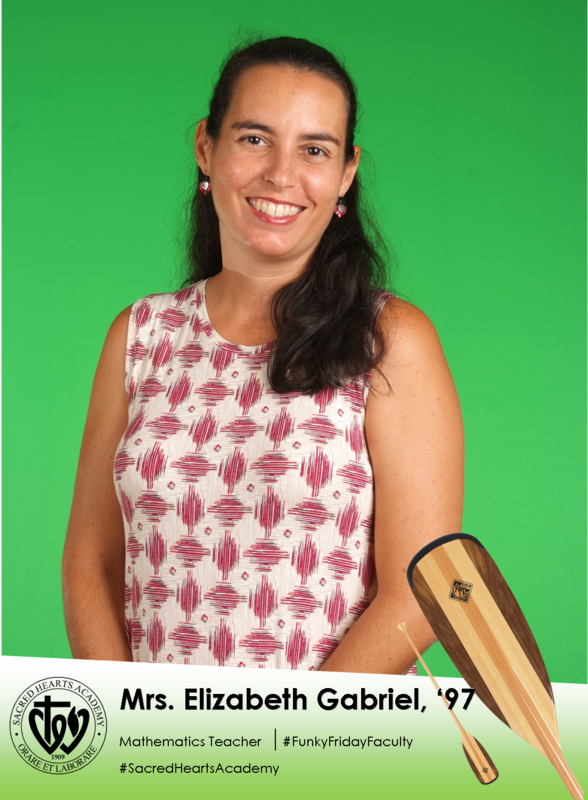 #FunkyFridayFaculty Meet Elizabeth Gabriel, '97! After earning her Bachelor’s Degree in Secondary Math Education and Masters in Private School Leadership from the University of Hawai’i at Manoa, Mrs. Gabriel returned to her alma mater, #SacredHeartsAcademy, where she has taught for the last 15 years. This year, Mrs. Gabriel can be found teaching Geometry and Pre-Calculus in addition to serving as the Class of 2018 Senior Class Advisor. But former students may recall her as their 7th Grade Math teacher, Algebra 2 or Advanced Algebra and Trigonometry teacher. She looks forward to showing off this year's Academy Math Department Halloween costume and "Christ-math TShirt"; both fond favorites of students, faculty, staff and alumnae alike! Outside of her work in the classroom, Mrs. Gabriel is an avid swimmer. She is no stranger to the water having competed in distance swimming while at the Academy in High School, completed the Waikiki Rough Water Swim 14 times, and paddled in the Na Wahine O Ke Kai six times - impressive!